This blog discusses the importance of children brushing their teeth. My colleague Ali Cloak recently wrote a blog on ‘Sugar Tax’ informing of the importance of brushing children’s teeth for two minutes, twice a day. In this blog I highlight the reasons why this is so important and report on the latest shocking statistics of tooth decay in children. In a recent report on the state of British children’s teeth, dental experts at The Royal College of Surgeons made the warning that children under 8 years old should be supervised while brushing their teeth. Nice guidelines have gone one step further and advised that brushing should be supervised by parents for children up to the age of 14 years. In 2014 NICE recommended that nurseries and primary schools should supervise tooth-brushing in areas with a high level of child tooth decay. The recommendations have been made because some children in England as young as five, have decayed, missing and filled teeth. It does seem that tooth hygiene differs in areas of the UK, with Leicester reporting to having 34% of children with tooth decay , this is compared with just 2% in south Gloucestershire. Over 30% of children in England did not visit a dentist in 2013-2014, a delay in recognising tooth decay often leads to dental extractions which are costly and time consuming for the hospitals that have to carry these out, this is frustrating as a number of these extractions could be avoidable if children regular visited a dentist. Removing the teeth of children under 18 cost £30 million in 2012-13. Professor Hunt has said that many hospitals are reaching crisis point in managing the number of children referred for tooth decay . 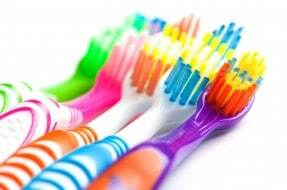 In January 2015 Nice guidelines suggested that they would like brushing to be taught in schools and are urging the Government to invest into an Oral health Programme. This has proved successful in Scotland and Wales. What do children think about brushing their teeth in school with school friends? Children seem to have mixed feelings about this, some commenting that they think it is a good idea to keep their teeth healthy and strong and others being conscious about brushing their teeth in front of each other . Whatever happens it seems clear that action needs to be taken to reduce this widespread issue. It only takes two minutes, twice a day, to brush your teeth, so whether this is done at home or at school we would urge you to invest this short amount of time, which could go a long way in preventing decay. The Sunday Times, 13th July 2014, Rotten teeth put 26,000 children in hospital. Public Health England, 2014, Dental public health epidemiology. Royal College of Surgeons, January 2015, The state of children’s oral health in England. BBC, Newsround, 22 October 2014, Should Schools make you brush your teeth.